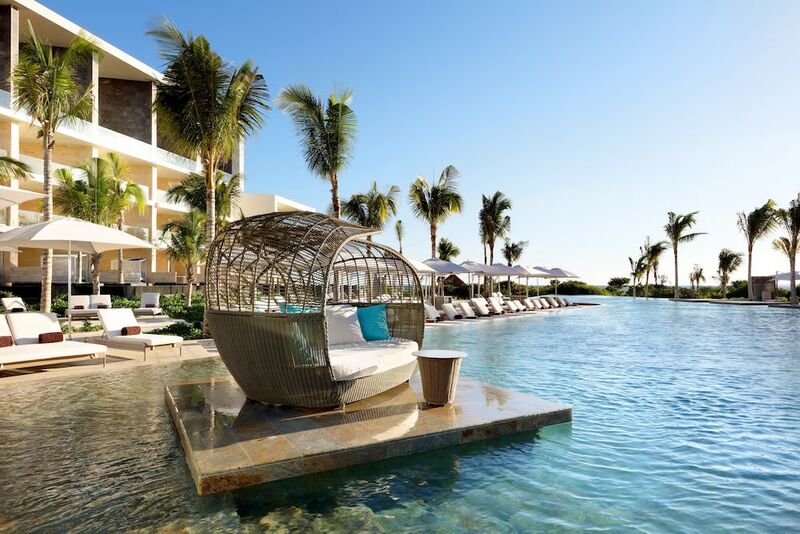 Like a moth to a flame, it’s too easy to land in Cancun and head straight to the Hotel Zone: the island-strip of man-made beach for identikit all-inclusive hotels that promise beach, sun and booze. It is, literally, where the party’s at. But that’s a disservice to everything else along the Yucatan peninsula. Instead, my base for most of the stay is TRS Coral, an impressive new five-star hotel just north of Cancun. It’s found in the Costa Mujeres region, a barely-developed, tranquil area of the Yucatan coast. Sparse as the area may initially seem, once you drive up to gates, a holiday-sized town opens up. It’s conjoined with the Grand Palladium Costa Mujeres, a sprawling 1150 room complex that has the benefit of scale (it features an architecturally-fascinating chapel and a busy resort village). 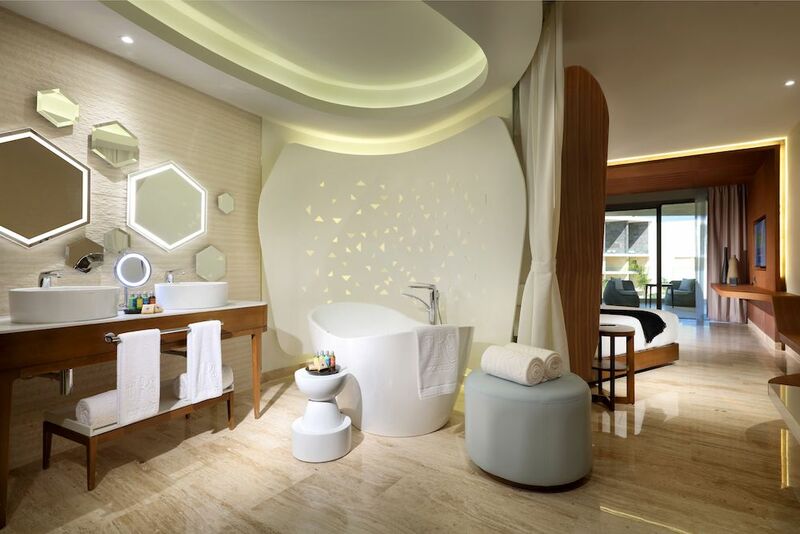 But TRS Coral is the premium, adults-only part of the resort, for a more pampered stay. The TRS wristband acts as the key to your room (modern technology eh?) 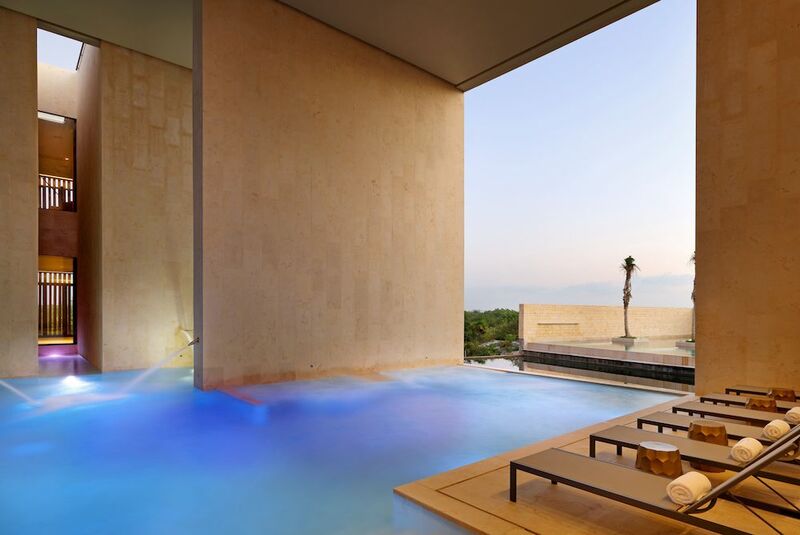 as well as gives access to exclusive facilities like a rooftop bar, private beach area and the main luxury pool. At this, a harpist plays as I relax in the in-water pods, all of which demonstrates it’s a higher class of accommodation. That’s the R&R taken care of. Being an all-inclusive, its food and drink are front and centre of its offering. That’s suggested by the four full-sized bottles of spirit in each room – but just ask your butler if you’d like to swap, say, the Johnnie Walker Black Label for a Jack Daniels if you prefer. While room service is on the house, there’s heaps of choice when it comes to dining outside: nibble on pizza by the pool, get the gladrags on for Argentine steak and red wine in El Gaucho (though only house wine is included), or feast on an international buffet at Capricho – far from the usual fayre, it’s high-end and delicately portioned. For an aperitif, there’s no better place to go than the Sky Bar, which looks out to the sea. Bliss. In the event that you want to dine further afield, the Grand Palladium’s bars and restaurants (a couple of which are 24 hours) are only a few minutes walk away…or hail the canal boat shuttle instead. Within the impressive resort village, there’s a made-to-order sushi bar (though the wasabi doesn’t have the kick we’d hoped), a traditional-style Indian restaurant and yes, an ever-popular Mexican restaurant; expect a modern twist to both its decor and menu. For adventures, there’s plenty of excursions to be had near the hotel. For starters, its shore faces Isla Mujeres, an island that’s a busy tourist spot, with an endearing air of authenticity to it. As the earliest tourist-friendly location on the Yucatan peninsula, it’s a little run down, a lot cheaper than you’d expect, and only some of the gift shops sell exactly the same things as the shops nearby. 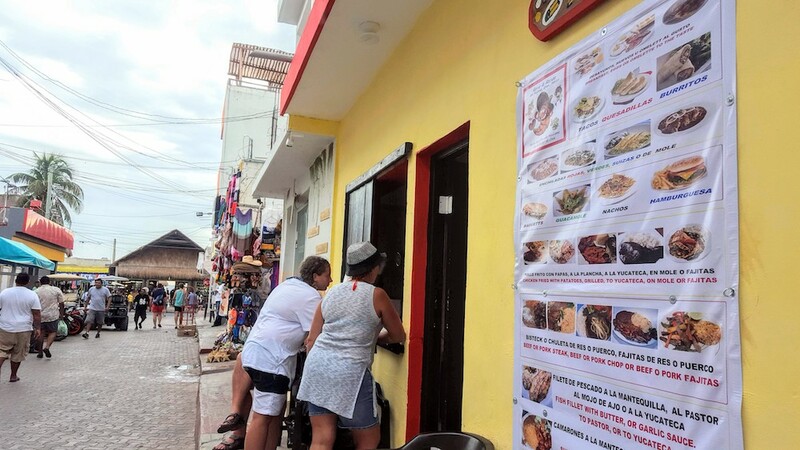 So it’s a great place to buy presents – especially as tequila shops are quite forthcoming with their samples – or enjoy a margarita and tacos. 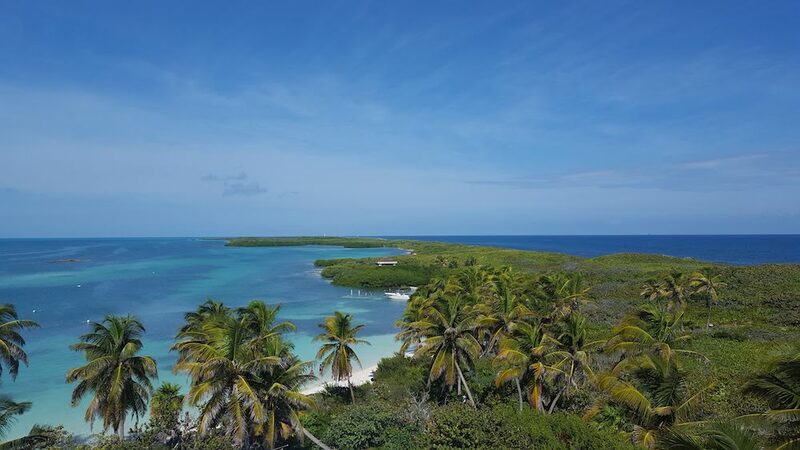 Nearby, the National Park of Isla Contoy is a strictly protected area where only 300 people are allowed each day, and smoking and sunscreen are no-nos, to protect the turtles who nest nearby. Rules understood, there’s a low-level competition to be the first boat to dock. It gives passengers a chance to discover this island as if it were a hideaway location from a Jurassic Park/The Beach hybrid, with untouched virgin-sand beaches, transparent-azure waters, craning palm trees, and pterodactyl-like frigates soaring in the sky in their dozens. As it happens, we’re second to dock today, but it’s still quiet enough to lie our belongings on the ground and dive in for a splash-around – though it turns out to be more fascinating to simply watch the trumpetfish and tiny, translucent fish swim around one’s legs, as the water is that clear. After a busy day out, it’s back to the hotel, this time to unwind at the spa. What looks impressive in size from the outside, turns out to be a haven of wellness on the inside. The gym is large, with a trainer who helps you out if you’re slacking on your workout. Clearly, he’s used to people in holiday mode and not trying that hard. The piece de résistance is the hydrotherapy area. The open-air vitality pool is filled with enough jets, buttons and bubbles that it feels like an adult water park, while next to it, there’s a gorgeous steam room and sauna. You can choose to cool off in the icy plunge pool, the ice room, or one of the cooling showers; the misty rain option was particularly relaxing. At the other end of the resort is the Rafa Nadal Tennis Centre, for the more active among us. Pristinely new, it’s a state-of-the-art tennis heaven with eight indoor and outdoor clay courts, and a range of courses (designed by the man himself) for both adults and children who want to learn or improve in heavenly surrounds. Or it’s there for a knock-about, to work off some of that buffet food. Further south along the coast there’s wonders like Tulum – worth a visit, but bring a hat and don’t make my mistake of visiting in the midday sun – and the many cenotes that advertise their existence along Route 307. The cenotes are natural rock pools that probably should be free to visit, but at Cenote Xunaan-Ha, it wasn’t the worst to pay for the use of the facilities and the pleasure of being pointed in the right direction. Maybe it was the makeshift experience of changing by the car in the middle of nowhere, but I felt like kid who’d stumbled across the pool spontaneously, and dived in with abandon. Splashing around the clear waters until sunset made shadows long and the colours golden, with only a couple of other friendly travellers doing the same, was a total hashtag-blessed moment. 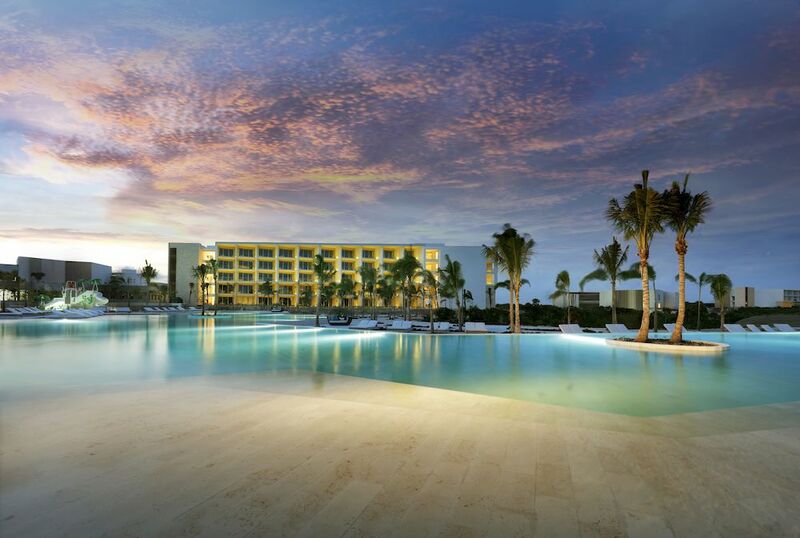 Along this stretch of peninsula, TRS Yucatan Hotel proves to be a closer base, and the chain’s ‘Dine Around’ concept means TRS Coral residents on a day trip can stop off for a meal here on their all-inclusive wristband. Open a year ago, 80 per cent of the original, mangrove-y jungle remains, making it a secluded and eco-friendly offering with flamingos, iguanas and bats in its midst. Those who choose to take up residence will find the TRS Yucatan is a golf cart ride away from the Grand Palladium Hotel, so it feels like an entirely separate resort. 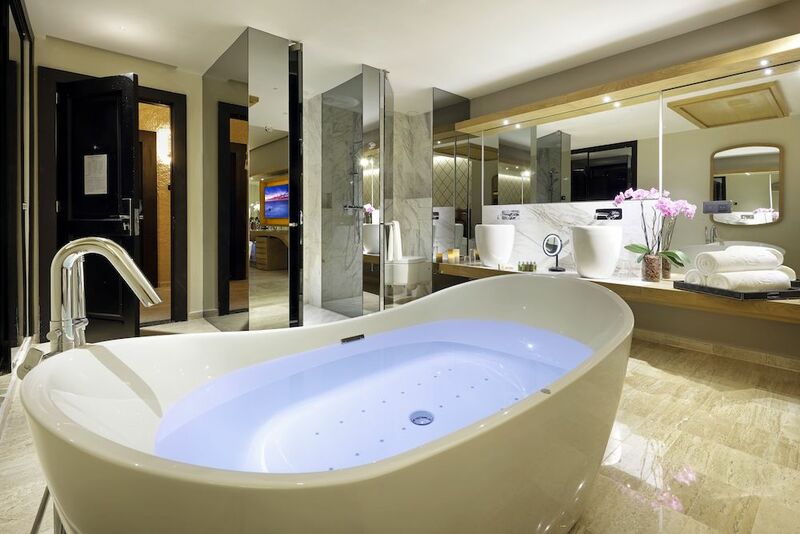 TRS’s entry level room is an impressively-sized space where a jacuzzi bath takes centre stage, it’s so modern that the lights are mainly automatic, and there’s plenty of USB power points. But the wow factor is the view from the balcony: the Caribbean Sea looks stunning outside. Yet even in this tranquil paradise, if you want bright lights and a buzzing atmosphere, you can find it. The cabaret show and dinner of Chic, included as part of the all-inclusive offering for TRS residents, is a premium dining experience with entertainment (it also runs at TRS Coral). In other hotels this ranges from cringeworthy to irritating, but the mix of party tunes to go with the margaritas – think incessant Bruno Mars, Michael Jackson or Beyonce medleys – and the surrealness of having near-naked dancers strut their stuff right by you, was enough to turn it into a silly, fun evening, and the best highlight of many along the Yucatan coast. Rooms at TRS Coral and Yucatan begin from around £262pn based on two adults sharing a junior suite on an all-inclusive basis. See palladiumhotelgroup.com for full information.